The study of ancient Egypt begins in the in the late 18th century and early 19th century with Napoleon’s adventures. Napoleon after he came to power realized that he was really no match for the English Navy led by Adm. Nelson. He designed a secret mission and recruited the best scientists and historians that he could find. They did not know where they were going except for the top military officials. Napoleon had decided to find a new land with resources that he could use in Egypt. There’s a long and interesting naval battle that ensues as Adm. Nelson chases Napoleon and his ships across the seas and ends at the top of the Nile were Napoleon and his ships land. The long and short of it, is that Adm. Nelson destroyed all of Napoleon’s fleet and left Napoleon stranded in Egypt without a way to get back home. Napoleon was not discouraged by this but instead marched into the heart of Egypt and more or less conquered it. The history of this is interesting and you should do more research on it. Nevertheless, Napoleon had a complete complement of scientists, biologists, botanists, and even language experts that allowed him to enter into Egypt, and build a new infrastructure for himself. While Napoleon was rebuilding his Navy in Egypt he also fostered the study of ancient Egyptian culture in which he was enamored. One of the greatest discoveries to come out of this was the discovery of what’s known as the Rosetta Stone. 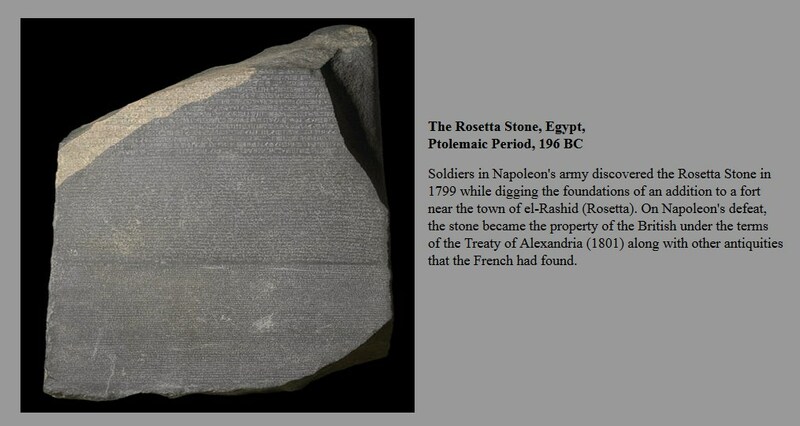 The stone contained in three languages, ancient Egyptian, demotic, and ancient Greek, a full account of a minor battle. 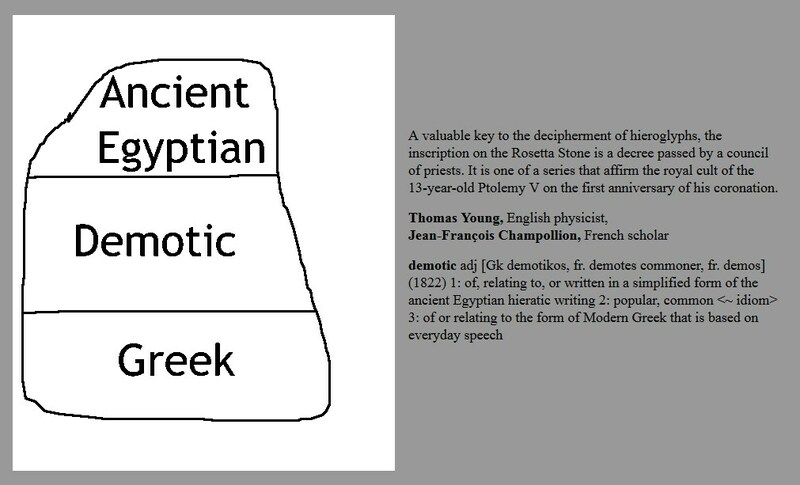 The same story was written in all three languages and this allowed a breakthrough in the study of ancient Egyptian languages and allowed historians to decode Egyptian hieroglyphics. Napoleon’s breakthroughs have allowed us to explore and understand Egyptian culture in a way that we understand Mesopotamian culture. Since we can do a detailed analysis of the stories, histories, and religious texts contained in religious and political artifacts we have a pretty complete picture of what ancient Egypt was like. In fact, ancient Egyptian hieroglyphs are very similar in some ways to Mesopotamian cuneiform. Other parallels between the cultures exist. Both cultures, Egyptian and Mesopotamian go through several phases in which the culture thrives, trade routes are established, and a well-developed culture and civilization flourish. They both start around the same time as well around 3000 BCE and seem to and roughly around the time of the birth of Jesus. They also traded with each other and shared things like art stories and religious ideas. The two cultures develop parallel to each other and interact with each other and borrow from each other. Like ancient Mesopotamia that has the Tigris and Euphrates rivers ancient Egypt had the Nile River running through it. The relationship of the rivers to the major city sites is significant in both of these cultures. However, Egypt was luckier in how the Nile behaves than the Mesopotamian people were. The Mesopotamian rivers seem to not flow in predictable patterns and sometimes even reverse and this makes it hard for the Mesopotamian cultures to irrigate and also sometimes even poisons the land somewhat with saltwater. Egypt was much luckier in that the Nile River runs from South to North and starts clean runoff from a mountain, Victoria, that lies in the heart of Africa and provides fresh clean water that created by the runoff from the mountain. The runoff irrigates and overflows the Nile River in a fairly predictable pattern. The Egyptians figured out how to allow the flooding to leave silt and new topsoil as well as irrigate the lands on either side of the Nile. 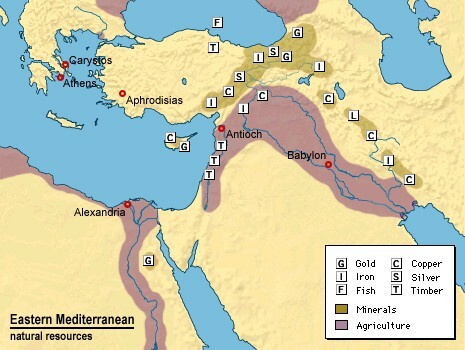 This creates so much grain for Egypt that they actually become the breadbasket and the major grain supplier for a large part of the ancient world especially when Rome and Greece are at their Heights. Another benefit of the Nile River is that it runs South to North however flow of air is just the reverse. Therefore one can coast from South to North with very little rowing and when one is ready to sell the opposite direction the sailors could just put up a sale and the wind was strong enough to take them against the tide of the river. This creates an almost superhighway for the Egyptians and also connects lower Egypt which is in the North with upper Egypt which is in the South. If you look at the timeline of Egypt you will see that historians have divided up into several major periods, however, in more depth you can see that historians have taken the names of the Kings from ancient Egypt and also created a series of dynasties. 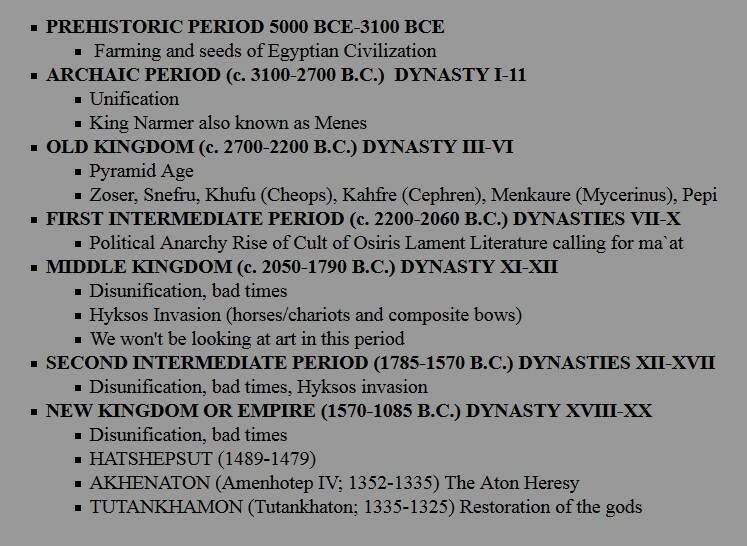 The timeline of Egypt can be confusing and the best way for person new to it to study it is to ignore the dynasty names and to look at the major periods that are bolded. In terms of art history there are really only two periods that we really study in depth the archaic period and old kingdom are the two most important in terms of politics and architecture. 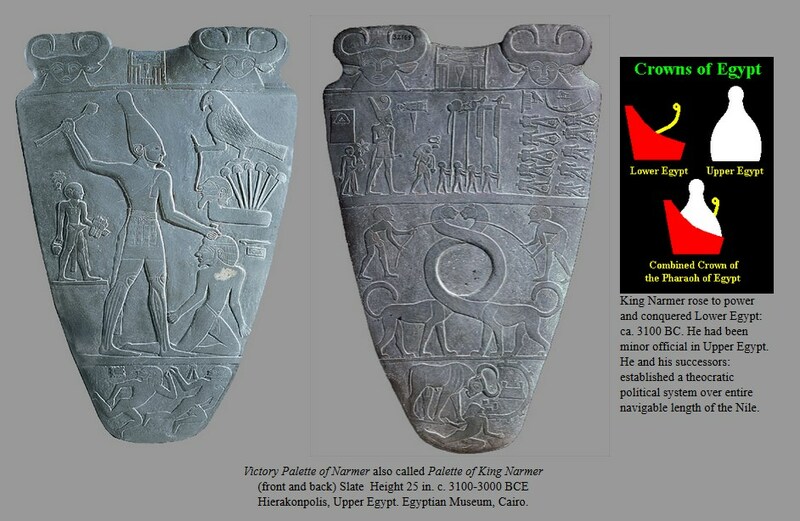 The archaic an old kingdom periods are when the pyramids were built and Egypt was unified by a King named Narmer a.ka. also “Scorpion King” and “King Menes”. A type of auxiliary era exists when the new kingdom comes about and there are series of interesting and almost unique set of rulers. One such ruler was Hapshetsut, who was a female King and ruled for short time. Another unique King was Akhenaton who created a new style of art and significantly changes the religion of Egypt for only about 75 years. However we do study his art in depth. His grandson, who wasn’t much of a King at all, he really didn’t do much is only famous because his tomb is the most complete tomb ever discovered in Egypt. Keep in mind that King Tut’s tomb is actually not an average are common tomb that you would’ve found around 3000 BCE to 2500 BCE. King Tut exists after a fairly interesting or strange time and his tomb is really just a hole in the ground with a couple of rooms carved into it that we got lucky about and nobody actually plundered. His art suffers from a little bit of the changes that his grandfather Akhenaton brought about. 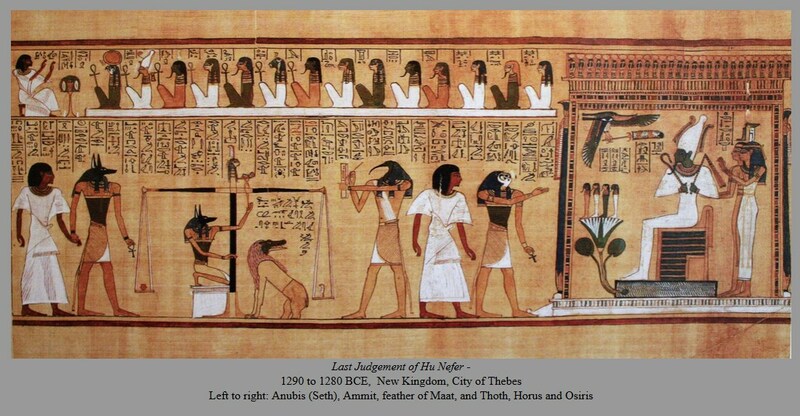 The gods and goddesses from ancient Egypt are very similar to the gods and goddesses from a lot of other regions. For example we have a female goddess who represents fertility and motherhood and her name is Isis. She is balanced, by a series of family members who are both her brother and her partner or mate. Osiris, is really the God of civilization and order and he is Isis’s husband. He is offset by a God who is not necessarily a devil he’s the God of disorder and he is a trickster and his name is Seth. 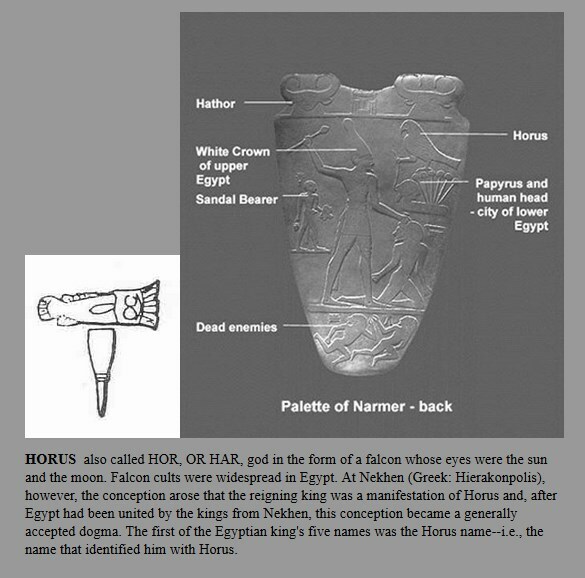 Isis and Osiris have a son named Horus who is often depicted as a falcon. There are other gods and goddesses who are important and get referred to in the texts as well as the artwork Egypt. If you do more research, you’ll see that several stories have parallels to religious stories and other cultures. There is one story that’s important and explains an awful lot about the artwork of ancient Egypt. Here’s a brief account of some of the stories that you will need to understand Egyptian art. 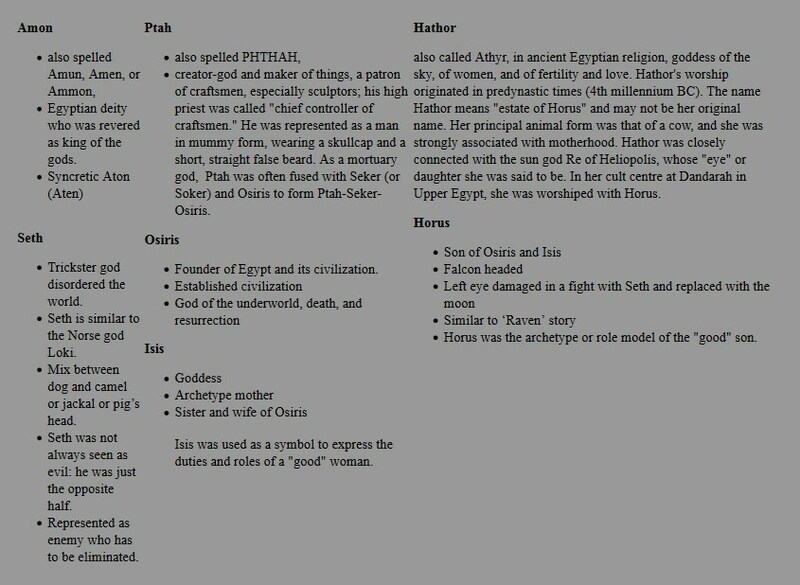 Our story begins with the God Osiris who is sometimes equated with some of the first gods and goddesses interacted in some ways with mankind and also established Egyptian civilization and culture. In some ways he’s the prototype of the good King. Osiris his brother Seth is jealous of him. He envies the fact that Osiris has married Isis has a son and is respected. In some ways, the story of Seth and are like the stories that we have from the ancient, epic of Gilgamesh. The main themes in both cultures are how good and evil or order vs disorder are a part of the world. It is very similar to the binary discussion of how people see things that Edmund Leach brought about in his arguments about how narratives and stories are constructed to show good and evil. The story begins with Seth sneaking in to Osiris his bedroom and measuring his body perfectly so that he can build a box that will fit Osiris. He’s going to trick Osiris into getting into the box and that he’s can seal him inside the box. After Osiris is tricked to be in the box Seth seals the box pours let over it and then floats it down the Nile River. Different versions describe how Osiris his body may have been cut to pieces and floated down the river other versions explain that the body remains intact inside the sarcophagus or box. The sarcophagus or box that were discussing is probably the prototype or schema for the Egyptian anthropomorphic sarcophagi that mummies are placed in. Osiris in his box floats down the river which is North into the ocean and it ends up in Lebanon, incidentally the Egyptians had extensive trade with Lebanon especially for the cedar wood that was available from Lebanon. 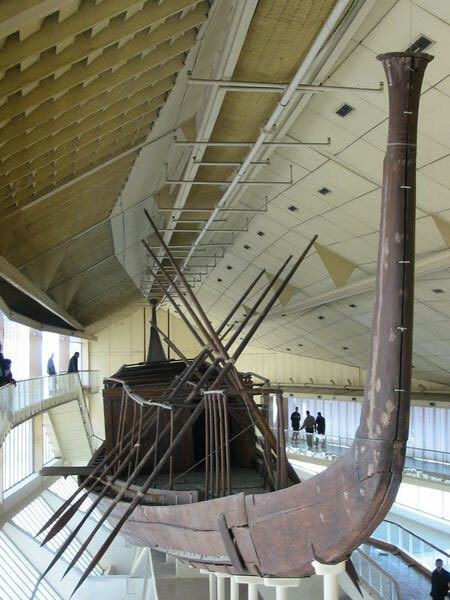 Egypt had almost no would’ve its own and had to import wood for things like boats and other objects and machines such as water out of the Nile wagons etc. The boat/coffin ends up being lodged in a large tree in Lebanon that the King of Lebanon uses to create a central pillar or column for the Lebanese palace. Isis who is looking for her husband who is in the strange situation of being inside a box inside a tree inside a pillar inside a Palace disguises herself as a nurse made and becomes very good friends the Princess who lives inside the Palace. The parallels in the story probably relate somewhat to the story of Moses (written into the Jewish Torah c 1000-800 BCE,) which is a religious story that comes after, the story from Egypt c 3000-2,500BCE. Isis who befriends the Princess convinces her to release Osiris from the pillar and his semi-death inside the coffin. She brings him back to life after repairing his body. 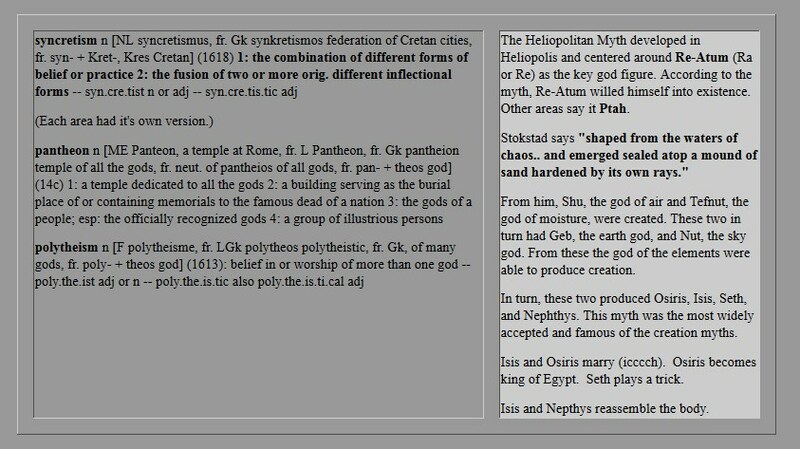 In some versions of the stories there’s an episode in which Horus and Seth fight and look for the body parts that are the results of some battle which Osiris is torn apart. In all versions of the story Osiris is physical form or body is restored incompleteness even when it’s missing a body part sometimes with the prosthetic. The main concepts that apply to Egyptian art from the story above are you have a coffin, restoring a physical body through some sort of magical or mummification process, and it epic battle between order and disorder. It deals with life and death resurrection and the battle between what we might consider evil and good. I suspect are concept of evil and good are different from the ancient Egyptians and this is a very complex subject. At some point around 3000 to 3100 BCE a King named King Narmer also known as King Menes (also the Scorpian King) comes to power and unites lower Egypt which is the northern Nile and upper Egypt which is the southern region of Egypt along the Nile and creates one continuous kingdom. The reasons for King Narmer coming to power probably have unification of trade routes and economics than probably any sort of ideological battle. When King Narmer unifies upper and lower Egypt it also means that there’s an infrastructure built-in and some sort of uniform taxation and Egypt does very well under this kind of United States kind of economic situation. The trade for Egypt explodes and they are able to sell their grain for semiprecious stones from Lebanon and other northern regions as well as along the silk route to places like ancient Italy. As a result, Egypt enters a period of stability and economic tranquility that allows them to start building major monuments around 2700 BCE. This palette is actually a stone makeup palette is a kind of monument that explains who King Narmer was and his accomplishments. This relief carving is made on a 25 inch tall type of stone. Most of the carving on it is fairly low relief it doesn’t project out very far from the surface. It is carved on both sides and was probably not used as utilitarian object since it is so large and heavy. Both sides are adorned with a combination of anthropomorphic figures as well as composite creatures that have both animal and human features. It also has a variation of sizes. All of the figures are portrayed in composite poses in which the head is in profile, the human eye for trade from a frontal point of view even though it’s on the profile view the face. The torso is facing the viewer while the legs are in profile view. The overall composition of the object and the picture plane on each side is divided up sections. One side has a large view of a large figure with the club holding onto the hair of a kneeling figure. Although this is portrayed in composite view the anatomy and features of each of the human figures is fairly lifelike or naturalistic. The animals for trade on both sides are also naturalistic. Beneath the main scene there is a smaller scene that is divided off by a line. At the top of this side is another two sets of heads divided off by a line. These heads represent the bull’s head. The composition of the other side is divided more into three bands or sections. At the very top of the carving are the same to bull’s heads that we saw on the reverse side. Beneath that are a series of figures some of them lain out horizontally and are missing their heads. Beneath that is some sort of animal giraffe like creature with some lion attributes and the next are intertwined. Beneath that is another horizontal line and it represents a bull with what appears to be a schematic diagram representing a city. This brings us next to interpreting the various symbols and their placement. 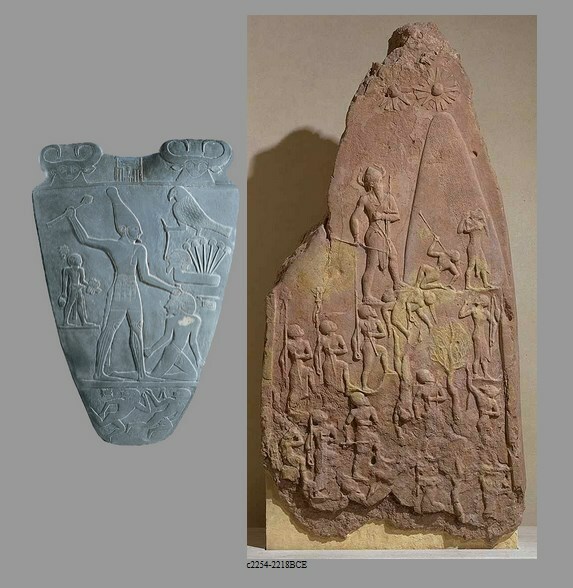 Overall the subject matter of this piece is very similar to King Naram Sin’s stele from Mesopotamia. It commemorates the victories and power of the King. In this case the King’s King Narmer and there are things that are more specific to his reign. For example you’ll notice that on the front and the back sides of this palette you can see the two kings crowns. 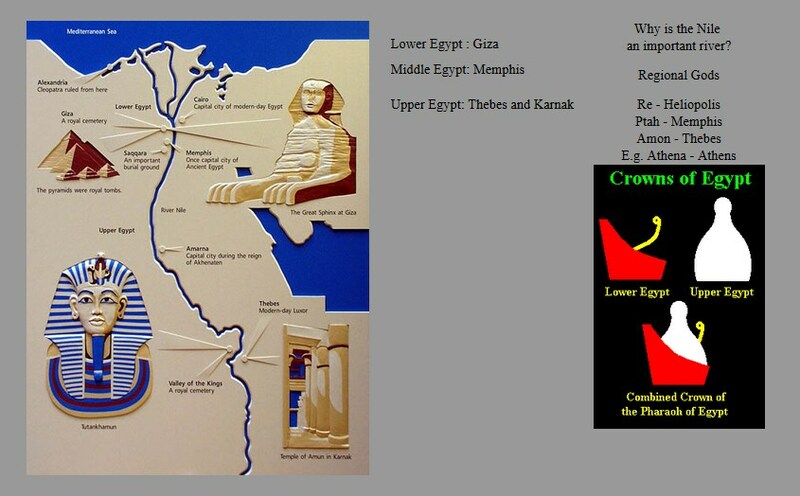 One represents lower Egypt and the other represents upper Egypt. The fact that he’s wearing both of these crowns is supposed to represent that he has power over both regions. Later on you’ll see the crowns combined in other headdresses by other Kings. 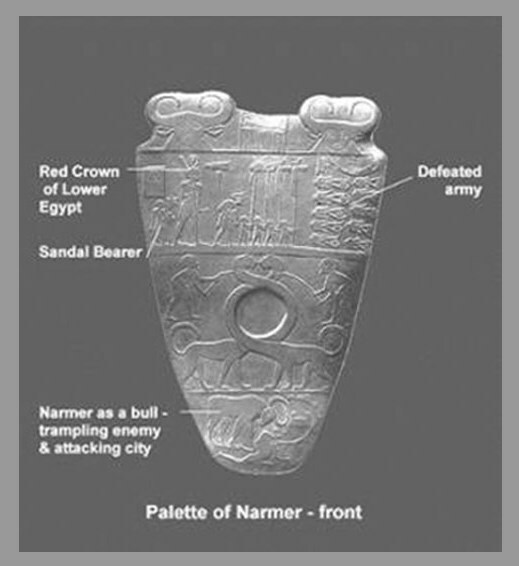 The next thing that you see in this also similar to King Narmer’s palette is that there’s a lot of “smiting” or killing going on. On one side the King dominates through hieratic scale his enemy. The King is larger than every other figure he standing in the center he raises a cudgel or a club he holds the hair of his enemy and this enemy is identified by having a special hairstyle. Behind Narmer and represented smaller than the King is the King’s “sandal bearer.” (You remember that one of the old Kings from Mesopotamia started out as a “cupbearer.”) This is probably showing his second-in-command. The King wears his crown as he battles the King of the lower Empire. Almost like a framing device with in the central image of the King slaying his rival is an image representing Horus the falcon headed God. Horus stands atop papyrus plants and holds in his clock a type of iron bar or crook that would’ve been used to pry open the mouth of someone dead. This was used in mummifying bodies and would’ve been identified in a way that said this person is dead. Above that central frame are two images of Hathor the bull goddess. We’ve seen a lot of bulls in this class and it probably means the same thing that we’ve been looking at before. Bulls are large and powerful creatures. Between the two bull’s heads is a cartouche were a type of medallion made of hieroglyphs. This is a kind of rebus. Here’s a rebus that you’ll identify readily from popular culture. Underneath this enormous seem of the smiting of the King of the lower quadrant of Egypt are King Narmer’s dead enemies who have the same hairstyle as the King he is slaying. On the other side of the palette you can see similar kinds of images although there are more of them. At the very top is the King’s medallion or cartouche. Hathor is also represented twice on this side at the very top and also at the very bottom as a bull defeating and attacking a city. We see the sandal bearer and we see the King wearing a different crown and in the center between him and his defeated army are a series of soldiers carrying standards very similar to the standards that we saw in the “Standard of Ur” from Mesopotamia. The interpretation of the two chimeric creatures in the center is not established as fact or very strongly. The theory is that the long next of this kind of creature represent to Lions with longneck’s and represent the intertwining of upper and lower Egypt and that King Narmer has brought unification and a sort of intertwined politics of the different regions of Egypt. The next themselves are around a deeper cavity and that shallow cavity might’ve contained eye makeup called Kohl for the King to wear. Egyptians used papyrus reeds as paper. 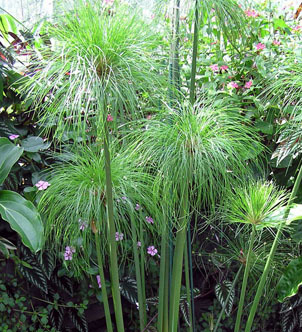 And papyrus reeds were used as paper throughout the Egyptian and Roman empires. The other type of paper or substance that was written in painted on was animal skin called vellum. Papyrus was much more plentiful and accessible in ancient Egypt and as a result many papyrus scrolls exist but none really dating past probably around 2000 BCE because the more papyrus is rolled and unrolled it deteriorates. In fact since its in roles the papyrus more damaged at the beginning and the ends of each of the roles because those of the persecute flex the most. Papyrus paper is made by slitting open a papyrus read and crisscrossing the fibers of different reeds almost like you would do with textile and then beating it with a flat rock or running it through a press which makes the fibers intermesh and when it dries it becomes a rollable large sheet of vegetable fiber. Scrolls made out of papyrus reads like this were found throughout Egypt and the calligraphy and painting on the scrolls is a significant document that lets us know quite a bit about the Egyptian religion. These were often found in tombs of both high and low Egyptian officials and aristocracy. There is a long history of these kinds of scrolls and the style of them changes at some points. This one dates from a kind of classic era of scroll making in ancient Egypt in which the style is fairly consistent and seems to go back all the way to about 2500 BCE. So it’s an excellent example of this type of work and the symbols and iconography are very clear. The diagram below labels clearly who each one of the characters, gods, goddesses, and people are in this scroll. This should relate somewhat to the analysis of the gods and goddesses that we did above. In this instance the scroll overall represents a minor court official name who Hu Nefur who has died and this is part of his journey into the afterlife. Because of the tell of Osiris and resurrection Egyptians believed that if you kept the body intact you would be able to save aspects of that person spirit or soul. The spirit or ”ka” of the individual was preserved first through mummification. 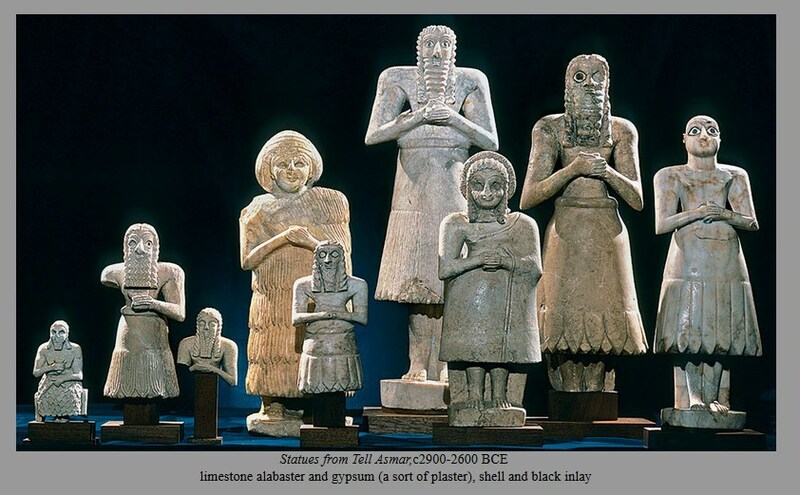 With the body intact and placed in a tomb the tomb would’ve been decorated with facsimiles or types of stand-in’s, similar to the voted figures that we looked at Tell Asmar in Mesopotamia. These figures were almost thought of as types of manikins or robots that the soul could inhabit and enjoy life in after the physical body stopped functioning. The Egyptians believed in a wonderful afterlife that one would exist and live in a world very similar to the Egypt that they knew and they would be part of the court of Osiris if they behave themselves in life. 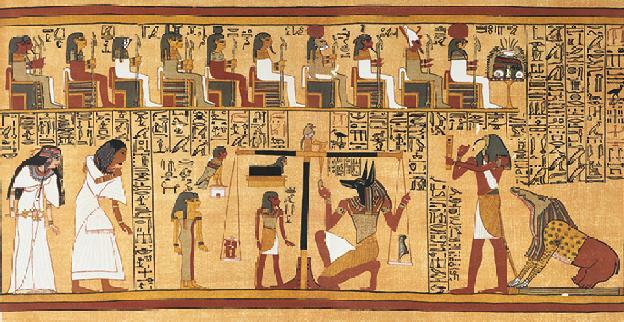 Much of the “Book of the Dead” was dedicated to discussing the ethics of the person who had died. In this seem we see that the soul of the dead person is being escorted by a jackal headed God called Anubis who is ushering the soul into a Hall where they would be judged. The heart of the deceased person was placed on a scale in which a feather from the goddess of justice, Maat, feather from her wing would be judged or weighed against the heaviness of sin in the heart of the person being judged. We can see a bird headed God named Thoth is recording the results. After that Osiris his son, Horus, escorts the deceased into another hall in which he is received by Osiris, and several gods and goddesses. A good comparison would be to compare this against the “Standard of Ur” because the standard of her has a sort of similar order hieratic scale, and even a type of scroll like storytelling in which things are divided up into bands. In this instance, there are hieroglyphic texts surrounding the images and so we know a little bit more about what’s going on. Technically I’m not sure if you could refer to these things as votive figures. A votive figure like the ones we found in Mesopotamia would’ve been used as a type of stand-in for worship in a temple. However, Egyptian sculptures are a type of stand-in for the soul to inhabit of the deceased. 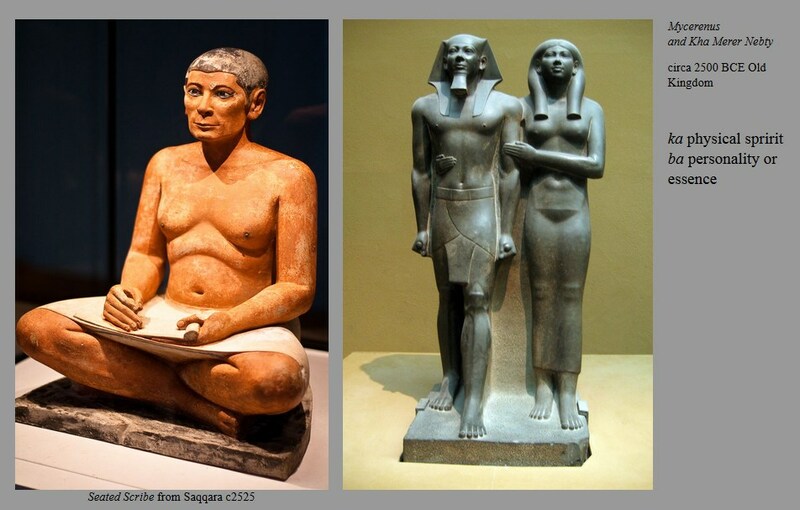 Also, some Egyptian sculptures such as the seated scribe are representations of people and things that in Egyptian aristocrat would need in their afterlife. 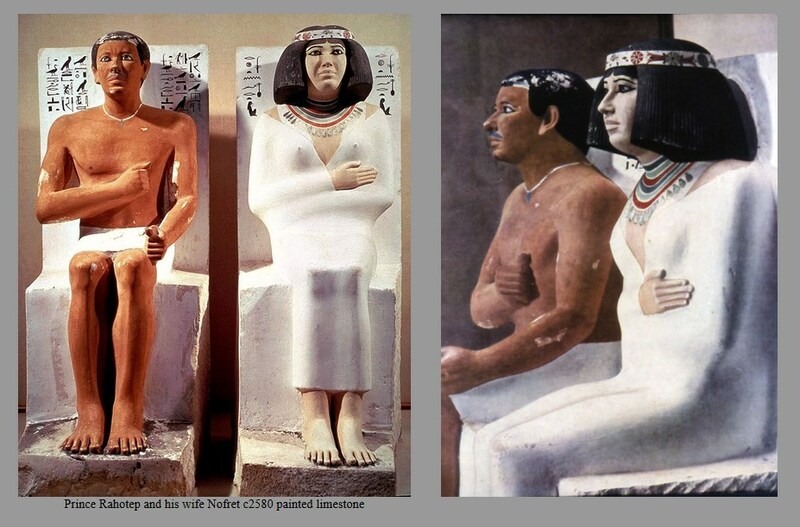 In the context of Egyptian culture life and art sculptures and effigies of people are really important. Not just as representations of a person but also for the fact that they are somehow magically inhabited or used after death. This means that their function is slightly different than the idea of sculpture in Mesopotamia. Scribes were an important part of ancient Egypt and were looked at as a enlightened an important class of people were just below the priests and the aristocracy. Scribes had the central skill of being able to read and write and this is really important in the Egyptian Empire because record keeping was extremely important. Therefore and effigy of a scribe or a picture of a scribe would be really important to be placed in a tomb so that the dead aristocrat would have access to someone who could do that kind of work in the afterlife. 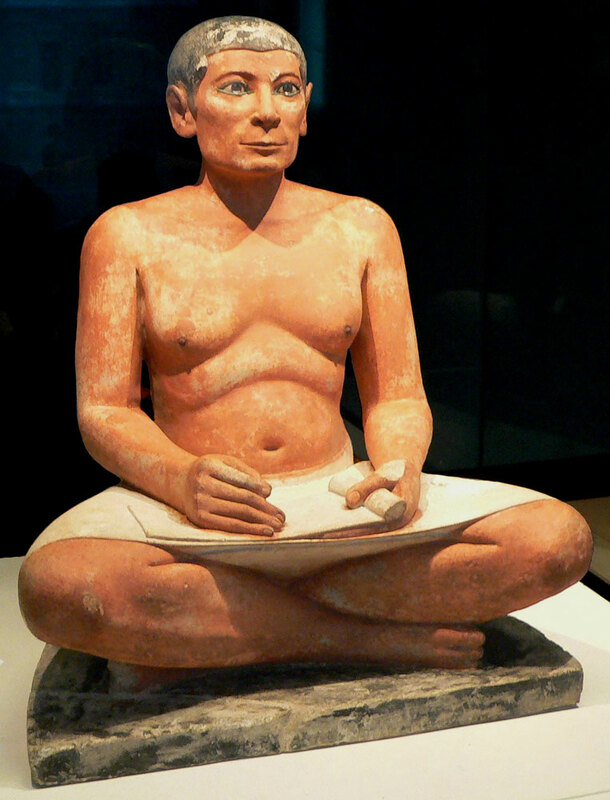 The seated scribe is much more lifelike and less idealized than other sculptures representing for instance Kings and Queens. This is because Kings were considered military leaders and would have to have the body of a soldier and be athletic however, if you study Egyptian art a little bit more in depth you will see that there are times when princes specifically will be portrayed as being slightly heavier and less athletic looking in a similar way to the scribe here. This ties in somewhat with iconography. 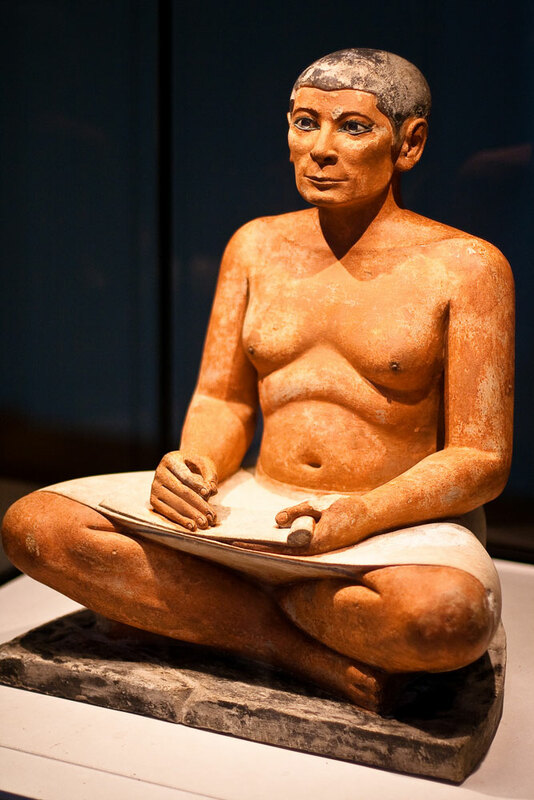 This seated scribe is portrayed as wearing a kilt he is seated the way a scribe would set and he is painted, we call this polychromy, with realistic skin color for a male in the Egyptian culture. His eyes are made out of cut class and the figure is made out of painted wood. This represents a seated scribe and the fact that he’s kind of fat he’s wealthy. The realism that we see here is often reserved for representations of the lower classes and the workers such as, scribes, architects, dancers and servants. Having a scribe in one’s tomb would indicate that they were wealthy and needed such things. Skin color is going to come up again with sculptures because representations of males often had them portrayed as having darker skin. Servants and priests had shaved heads, and the upper-classes wore wigs and fake beards. The starched white kilt that he is wearing is a symbol of his job and his wealth. One could not afford to keep a starched white garment if they were doing physical labor. The iconography of the sculpture of Mycerenus and his wife demonstrate the other half of this kind of iconographic system. This sculpture represents and idealized version of the physical form. The waist some the figures are very thin and the shoulders are broad. The arms are muscular. The figures’ faces have very little character or individuality. The hairstyles and headdresses are geometrically stylized as his some aspects of the body. In both cases, the male and the female figures, the anatomy is somewhat heightened by the look of the clingy drapery, especially in the female form, although these are a very realistic representations or naturalistic they are also very stylized. The way that Egyptian sculptures are made is that a drawing is made on the front of a block of stone and a profile drawing is made on the side of the block of stone and then the sculptor chisels away until the two representations meet. This is why this sculpture tends to look a little bit more blocky and stiff because it literally is made from a block of stone and the subtractive process still leaves a very blocky look about it. Preparing a Block of Marble to form a Greek Kouros Sculpture. 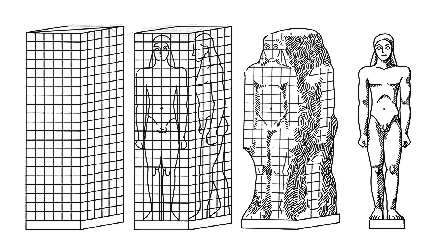 (Egyptian Sculptors used the same technique) A Grid of Lines was drawn and the Figure projected. A method that was applied for some early Kouros sculptures. Diagram from S. Woodford, An Introduction to Greek Art, Cornell University Press, 1986. The pose that you see here is an iconic Egyptian pose; you will see this pose many times in ancient Egypt where the figure seems to be standing almost at attention with one foot stepping forward. You will also see this type of pose in ancient and archaic Greek art. Later on in ancient Greece a new pose will come along which replaces this but look somewhat similar. 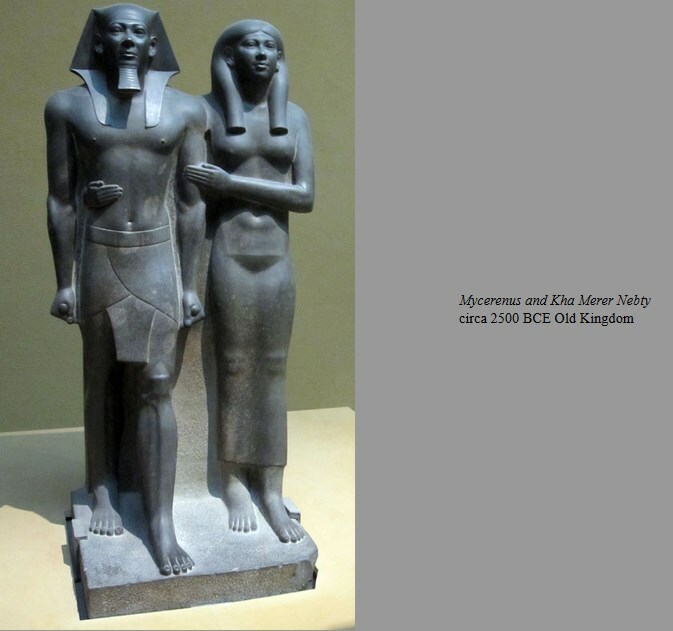 In essence, the sculpture of the King and his Queen’s and idealized version of who they are in every way. The King is meant to be an athletic soldierly looking type of person and other icons that represent his power are the fact that he’s wearing a starched kilt, he has a beard, and he is wearing a headdress called khat. This headrest was reserved primarily for high level aristocrats and when you see it in movies it’s the wrong representation. The headdress is somewhat representative of the Kings relationship to the icon of the cobra. Cobras in ancient Egypt have a large significance and are linked with aristocracy and monarchy. The beard is also a fake beard that the King would have worn as a symbol of his kingship. The female figure in ancient Egyptian art has somewhat softened conventions however in this case we see the Queen represented in a very similar manner to the King. The Queen would’ve worn a wig because they had shave their hair off. Several sources indicate that there are two reasons for the aristocratic class is shaving their bodies one is for hygiene and the other is for convenience. 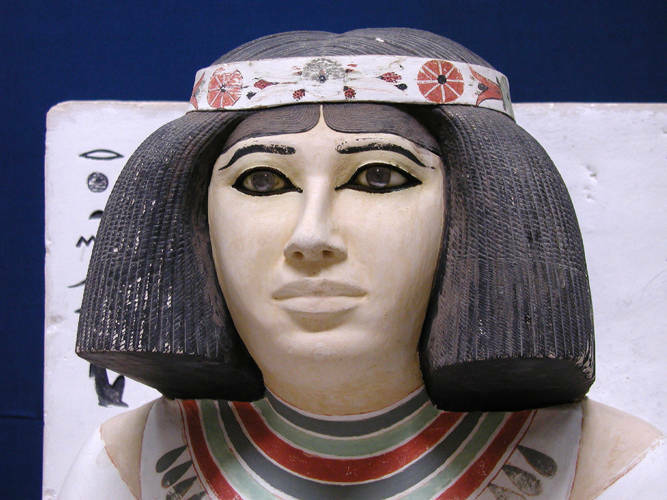 So any hair that you see on in Egyptian figure is usually some sort of wig or fake beard. King Snefru was a very important King because he is the one who developed how to build the pyramids. In fact he has three pyramids. This representation of a prince and his princess is a good example of how aristocracy would’ve been depicted in a different medium than limestone. In this instance this is painted limestone, remember that sculpture before this was unpainted and might have been. The eyes of the figures are made with cut crystal and there is jewelry painted on both of the figures. An interesting detail, is that the wig on Princess Nofret is shifted slightly and you can see her real hair or the fringe of it sticking out. This is an excellent representation of royalty from the time of the pyramids. Or just before it because pyramids were used after their death. The Prince and Princess are seated on a type of throne. Indicating some sort of stature. The poses are standard poses for Kings and Queens from Egypt the way the arms are. The body of the King is thin muscular and athletic. The body of the Queen is probably the ideal of an Egyptian desirable woman. The skin coloring is part of the iconography. Depictions of men often have them painted with a type of red ocher paint while the females have a yellow or white ocher used which makes them lighter. A theory discussing or explaining the skin color between male and females has been offered by some of my instructors. Probably it comes from the different roles of men and women in Egyptian culture. Similar to Victorian England maybe women were kept inside more and men were allowed out more or were out more and this is represented by the different skin colors. Other theories also have to do with rank and stature between men and women but I’m not sure how viable these theories are. The jewelry in a general discussion is also interesting because semiprecious stones and even diamonds are not readily found in Egypt. In fact Egypt’s contact with any kind of place that has diamonds comes long after the sculpture was made. The representation of jewelry on sculptures like this kind of ties in with the idea of a facsimile representation of something from the real world being used magically in the afterworld. Also, the addition of extra types of semiprecious stones on the princesses garments are also a representation of wealth. Egypt had to import its precious stones from Cyprus and Lebanon. And there are even stories about servant girls who lose their jewelry while on the Nile. The King in this instance has a magician part the waters so that they can get at them. Note that this is years before the Moses story comes out.